It's not hard to spend the minimum amount required to qualify for free delivery when you see all the amazingly stylish clothes on offer here. Once you have selected your items, they will be delivered for free to your door. Look cool while you keep yourself warm in these stylish coats and jackets. You'll find soft jackets and capes that will enhance the look of your outfit rather than just cover it up. Whether you want a smart tailored look or something soft or feminine, you'll find just what you need here. Where do I use my Coast voucher code? Find a code you would like to use, copy it and follow our link to the coast website. Shop as normal and add your items to your shopping basket. When you are ready to proceed head over to the basket and enter your discount code into the section just under your order summary. Click 'apply' and your discount will be applied automatically. Click ‘Checkout Securely’ to proceed with your order. The site has a helpful Editor’s Pick feature and handy buttons to Help, Wish List, My Account and Stores sections with the latter listing 52 standalone stores and 185 concessions across 147 international locations. So, for sartorial elegance and stylish fashion for both demure and panache additions to your wardrobe, look no further than Coast. Glad rags for weddings feature to make this most romantic of events effortlessly stylish for not only the Bride but also her Bridesmaids, Flowergirls and Mother of the Bride. Coast sell a wide range of beautiful dresses in a collection of flattering shapes, designs, and colours. At Coast you will be able to find your perfect dress for any occasion at any time, whether it's a party outfit, a daytime look, a midi dress, maxi dress or any other dress you may require you can find it at Coast. With a range of colours, sizes, and prices you are sure to find the perfect dress you had in mind. Coast not only sell fashion online they also have outlets and stores around the world where you can find great outfits and fashionable pieces for great value for money. Find your closest Coast Outlet or Store online now or browse online and order your chosen outfit, select it and opt for delivery at the checkout. You can find great offers and deals at Coast. With a constant sale section in their category list, you can enjoy big reductions across the online store as well as additional exclusives and seasonal offers. By signing up to the Coast newsletter you will receive the heads up on upcoming discounts before other customers, so you won't ever miss out on great prices. You can also use discount codes to save money on your order, simply apply these at the checkout. Find more Delivery Details & Information here. If for whatever reason you wish to make a return, you can do so Free of Charge with the Coast Doddle service. Items must be in their original packaging including labels and tags. They must also be unworn and in their original state. You can find more returns information on the Delivery & Returns page. Find the opening times for your local store using the Find A Store tool here. Submit a Request via The Online Contact Form. 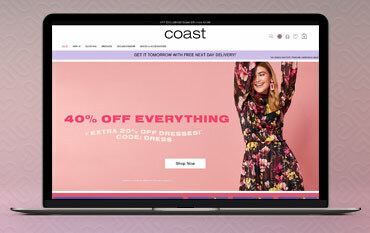 Coast-stores.com is the online store for the award-winning women’s fashion brand Coast. The art of feminine draping is elegantly covered with the site offering the very best in dressing up for every occasion and promises glamour, elegance, and drama in all of its clothing and accessories for any event, party or celebration.